Over the past ten plus years, more and more companies across the country have forsaken hiring new employees and have used more independent contractors. Now, we all know why corporations are using independent contractors instead of hiring new employees–attention to the bottom line. Independent contractors can be hired for a specific project, and since they are not an employee, there are zero benefits being paid out, which can save the company quite a bit of money. As a result of this shift in corporate operations, the consulting industry has seen quite a boom in the last ten years. Professional Liability Insurance Coverage provides protection against your failure to perform, financial loss, and error or omission of the products or services sold by your company. If your Arizona company provides a professional service in the areas of a Management Consultants, Web Designers, Event Planners, Media Consultants, Project Managers, or one of the countless other professions there are, then acquiring a Phoenix Professional Liability policy is extremely vital in protecting your company against a claim being filed against it for any actual or alleged damages due to your company’s error for provided services. Please be aware that General Liability Insurance Coverage will generally exclude Professional Liability Coverage. We highly recommend to all our clients that they carry both coverages as part of their overall insurance program. When looking at what limits will benefit your company, you will need to complete a thorough review of the risks your company will be taking with its current list of clients and also potential new contracts it may take on in the next year. Because you are on your own, you are responsible for any claims, and not acquiring the proper amount of coverage could be very devastating to your company’s survival should your company be sued or be forced to pay a claim. Professional Liability Insurance Coverage provides protection against your failure to perform, financial loss, and error or omission of the products or services sold by your company. In most cases, additional coverages for your company, such as intellectual property, breach of warranty, security, and cost of contract, can be added. Typically, in most cases, General Liability Insurance Coverage will only cover a claim from a bodily injury, property damage, personal injury or advertising injury. Professional liability Insurance is a form of liability insurance that will help protect companies or individuals for professional advice and services provided from bearing the full cost of defending against a negligence claim made by a client and damages awarded in such a civil lawsuit if they should be awarded. This type of insurance coverage focuses on alleged failure to perform on the part of, financial loss caused by, and error or omission in the service or product sold by the policyholder up to the limits of the policy. In most instances, Professional Liability Insurance Policies are issued on a claims-made basis or claims made and reported basis, which means that the policy will only cover claims made and reported during the policy period. To be more specific, a typical professional liability policy will provide indemnity to the insured against loss arising from any claim or claims made during the policy period by reason of any covered neglect, error or omission committed in the conduct of the insured’s professional business during the policy period up to the limits of the policy. Claims which may relate to incidents occurring before the coverage was active may not be covered because most policies have a retroactive date. As we all know, as a professional consultant, you or your company is expected to have extensive technical knowledge or training in your area of expertise, performing the services for which you were hired according to the standards of conduct in your profession. Any failure in this level of skill expected of your company could result in your company being held liable for damages. Regardless of the professional services your company performs, such as a Web Developer, Property Manager, Community Associations, Media, Management Consultant, Event Planner, or one of many other professions, Professional Liability Insurance is a must for protecting your business. This type of Phoenix business insurance coverage can provide protection in the event you are held liable for damages due to your error of those provided services. 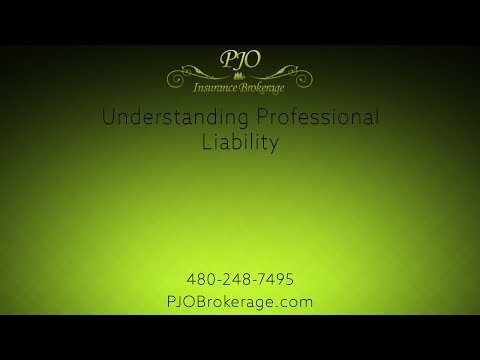 If you would like to explore ways to decrease your insurance risk factors, please contact the experienced and professional brokers at PJO Insurance Brokerage. We look forward to working with your company to help you create an insurance program for your particular company’s needs.